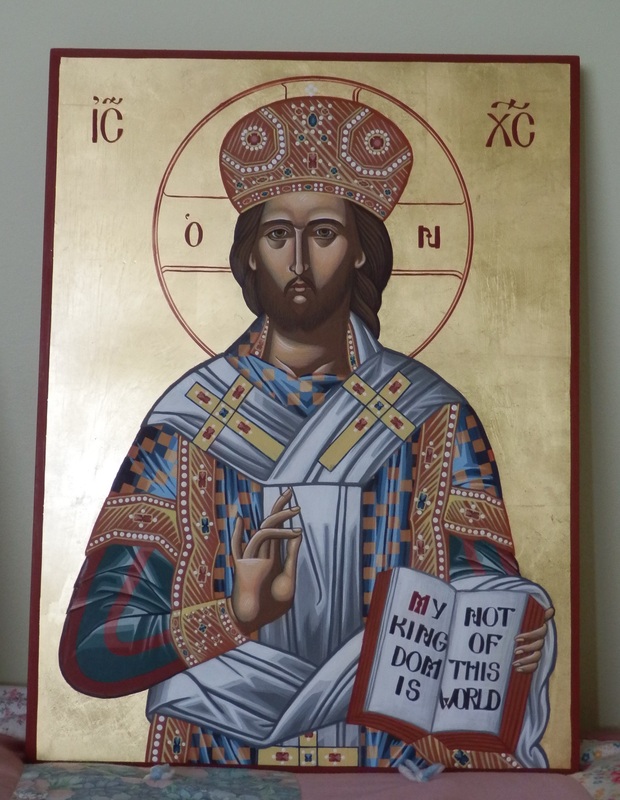 Christ the High Priest, for our home chapel. God the Word became circumscribed in His historical incarnation and thus the iconographer can now circumscribe Him in icons: “But if He assumed humanity in truth, as we confess, then the hypostasis of Christ is circumscribable: not according to its divinity, which no one has ever beheld, but according to the humanity which is contemplated in an individual manner in it (10)”. However, this does not mean that the iconographer merely depicts the human nature of Christ, rather he depicts Christ’s person (hypostasis). That is, he depicts His full humanity and His full divinity as they are contained in His divine person: “neither the divine nor the human nature alone is depicted, but the hypostasis of Christ with the particular characteristics which define His human nature, that which the icons of Christ present is the person of the God-Man, the person of the whole God and of the whole man and it is understood and exists with His two natures.” Wherefore, the iconographer ought to take care when painting icons, for he is clothing – in line and colour – the invisible God according to His visible image, the God-Man Jesus Christ. 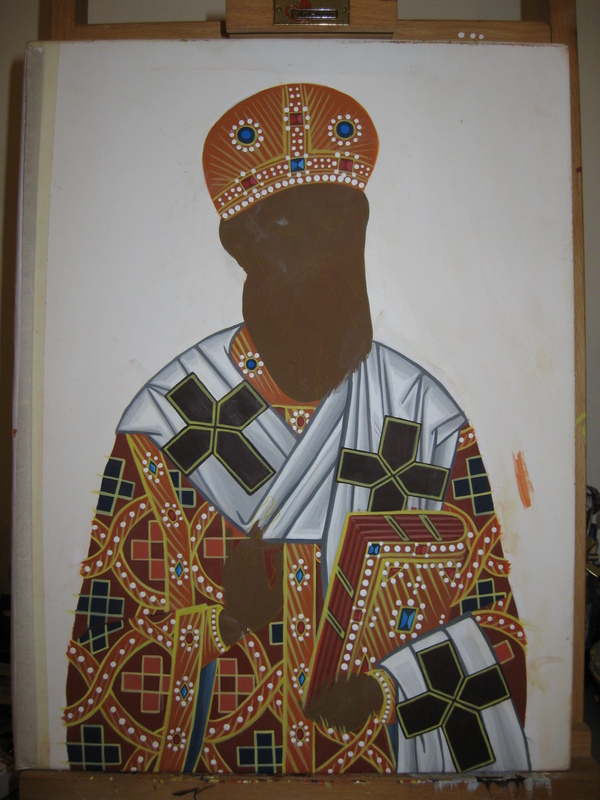 Iconography Trivia: The first part of painting an icon is to place gold on the board or paint it ochra (yellow). However, here I’m setting a bad example. 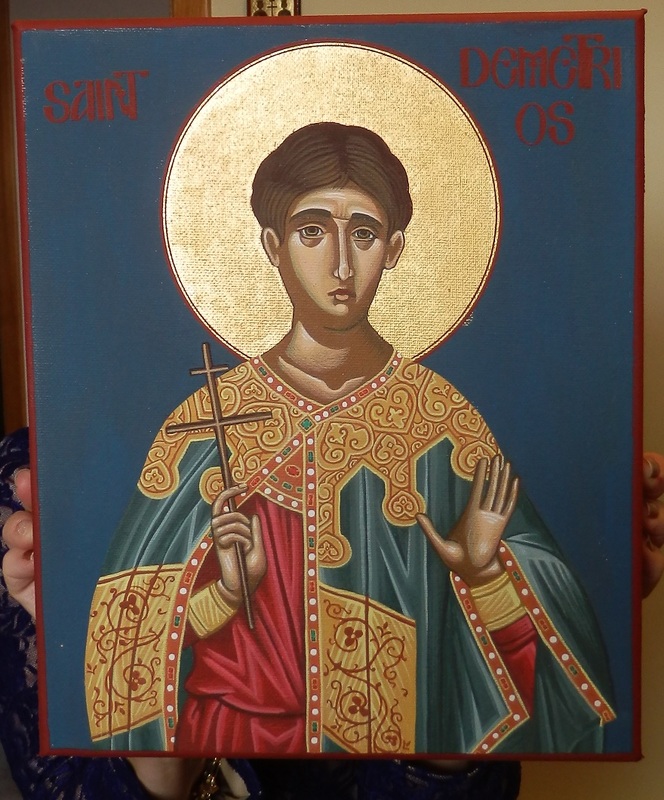 St. Nektarios doesn’t have gold yet because my teacher doesn’t let us apply the gold until the end. He thinks the gold will be ruined while we paint. Obedience before custom, I guess. Since saints are dwelling places of the Holy Spirit, when they are painted in icons it is not merely their human nature that is depicted but their whole person which participates in the uncreated grace of God and thus once again, the iconographer puts into colour and line what is invisible, “I cherish… everything connected to God’s name, not on their own account but because they show forth the divine power… I venerate and worship angels and men, and all matter participating in divine power and ministering to our salvation through it”. St. Theodore Studite, On the Holy Icons, 87, 24, Refutation 3. 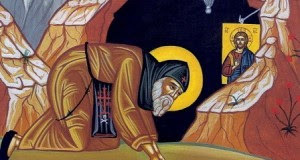 St. John Damascus, Apologia to those who decry Images, . An excerpt from Chapter 2 of my Master’s thesis The Theological Presuppositions of the Orthodox Iconographer according to the Stoglav Council (Moscow 1551). The second presupposition of the iconographer is to struggle to live a pious life. The Stoglav council expressed in detail the type of life which is expected of an iconographer. Since iconography is based in liturgical mystery (namely, God’s coming into Creation) it is only proper to address the relationship between the iconographer’s life and work. 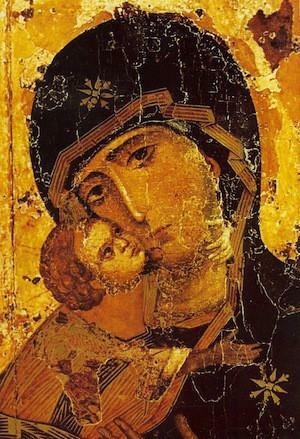 Furthermore, the sacredness of the icon deserves to be respected in both an artistically and morally honorable way. And so it was for this reason, “the Stoglav’s essential prescriptions aimed at raising the level of quality of iconography and the moral level of iconographers.” Thus we shall begin by addressing the council’s statements on living piously to better understand the influence a pious life has on the icons one paints. 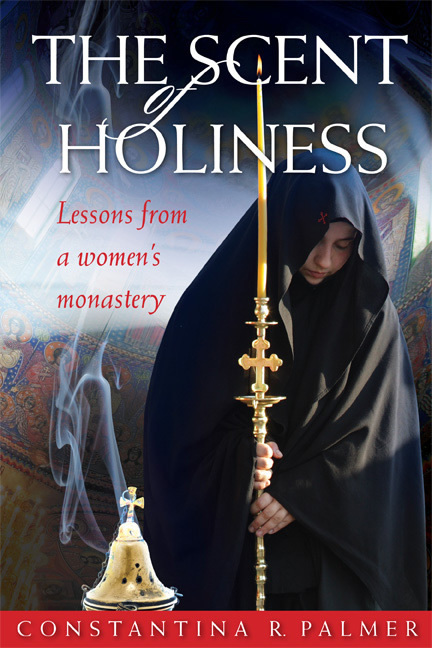 The activity of going to spiritual fathers, confessing, living in obedience with a humble, temperate, and prayerful manner is the foundation for painting sacred personages with great care. These actions cultivate and maintain the appropriate spiritual disposition befitting an iconographer. 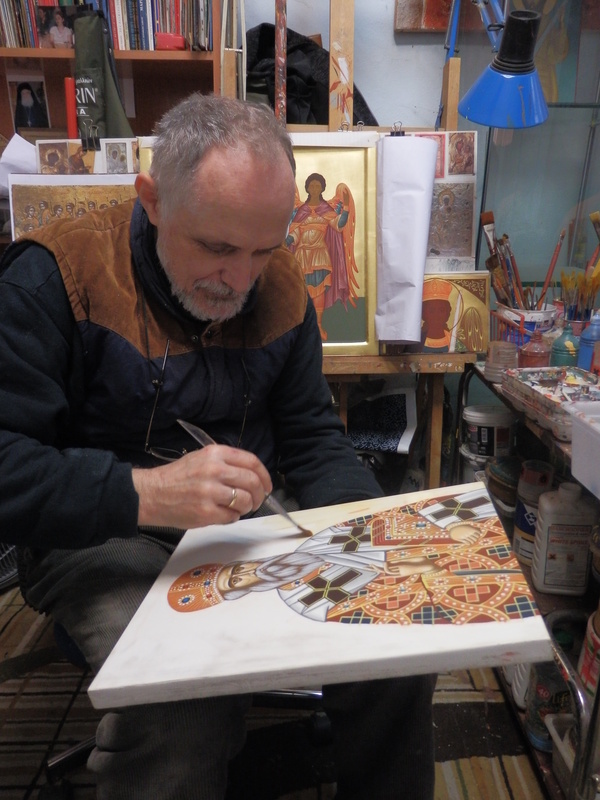 Wherefore, not only through artistic talent but together with piety, the iconographer will properly convey the spiritual content in holy icons, as Photios Kontoglou points out: “you must know well the technical things of your art. But this is not enough. Most necessary besides this is to have a soul that is strong and rich in spiritual things, so that your hand might manifest that which you have within you.” From this we see that even the personal spiritual state of the iconographer can have an intimate influence on what is manifested in sacred images. See Evdokimov, Theology of Beauty, 144. Ouspensky, Theology of the Icon, vol II, 300. Carvarnos, Introduction Fine Arts, 32. (Excerpt from Paul Evdokimov’s The Art of the Icon: A Theology of Beauty, pp. 208-209). “Christ is the image of the invisible God, the firstborn of all creation” (Col 1:15). Now even the first defenders of the icon separated, rather simplistically, the two natures and put the visible with Christ’s humanity and the invisible with his divinity. But the image cannot be divided along the lines of the natures, for it refers back to the person of Christ in his unity. A person in two natures means an image in two modes, visible and invisible. The divine is invisible, but it is reflected in the visible human aspect. The icon of Christ is possible, true, and real because his image in the human mode is identical to the invisible image according to the divine mode; the two images constitute the two aspects of the one person-image of the Word of God. According to St. John Damascus, the energies of the two natures, the created and the uncreated, penetrate each other. In the hypostatic union, Christ’s deified human participates in the divine glory and shows us God. The Christological perichoresis, that is, the exchange of idioms, calls to mind the same and reciprocal co-penetration of the two natures and makes more explicit the mystery of the one image according to two modes of expression. This allows us to say that the humanity of Christ is the image of his divinity. And again, “He who has seen me has seen the Father” not say “has seen God” but rather, “the Father,” for the Son is the image of the Father and thereby the expression of the Trinity. The unique person thus possesses the unique image-icon in two modes of expression: seen by God and seen by man. My iconography teacher preparing to put gold leaf on my icon of St. Nektarios. Whether this particular canon was merely applied locally in 16th Russia or universally (which would be the ideal) the underlying sentiment remains the same: A pious life befits one who transmits either his own spiritual vision or that of others.